Sok Thim examining a patient with XDR TB treated by the CHC/Vietnam drug-resistant TB/XDR project at Pham Ngoc Thach Hospital in Ho Chi Minh City. The patient who is a 23 year old pharmacist was bedridden and one of her lungs was destroyed due to XDR TB last April. Having gained 4 Kg and responded beautifully to therapy , she is feeling strong again. Tuberculosis is a potentially lethal bacterial infection that is both curable and preventable. Treatment programs featuring Community Treatment Model (daily-observed therapy, short course) and a six-month regimen of antibiotics have been used successfully in every country in the world. However, not everyone with TB disease has access to the cure. As a result, TB causes approximately 2 million deaths each year and is the leading cause of death worldwide for children and adults with AIDS. Poverty, conflicts, lack of effective government and the rise of HIV/AIDS have all contributed to the persistence and spread of this often deadly but curable and preventable disease. The CHC is a member of the StopTB Partnership of the World Health Organization, a network of international organizations, countries, public and private donors, governmental and nongovernmental organizations and individuals that are working together to achieve the goal of a world free of TB. In its Global Plan to Stop TB, 2006–2015,the Partnership and the WHO set a goal of halving the global burden of TB disease by 2015, and eliminating TB as a public health problem by 2050. The progress toward both goals is being threatened by the rise of drug-resistant forms of the tuberculosis germ or bacteria. Antibiotic-resistant TB springs up when first-line treatment is interrupted, or the medicines are of poor quality or are not used correctly. When the TB bacteria is no longer killed by the two most powerful first-line drugs, isonized and rifampicin, it is called drug-resistant TB. Drug-resistant TB is still curable with second-line antibiotics, but treatment becomes much more challenging. The drugs usually cause very difficult side effects, and the time needed to achieve a cure increases, from 6 months for conventional TB to 18 months to 2 years for drug-resistant TB. Even with these additional hurdles, a major obstacle to treating drug-resistant TB in poor countries is simply the cost of the medicines. Antibiotics to treat drug-resistant TB are over a hundred times more expensive than first-line drugs, and treating a single patient costs thousands of dollars at market prices. As a result, the vast majority of people in the world with drug-resistant TB get no treatment whatsoever. Fueled by the lack of medicines and the AIDS epidemic, drug-resistant TB is on the rise in many parts of the world, and particularly where HIV is prevalent. The WHO estimates that 1.5 million people in the world have drug-resistant TB and some estimate that up to 5 million people may have drug-resistant TB globally. Swift and successful treatment is imperative: If the second-line regimen is interrupted or improperly administered, the bacilli can mutate and develop further drug resistance. The result is extensively drug-resistant TB (XDR-TB), where the TB bacteria is not only resistant to isoniazid and rifampin but also to two other classes of second-line antibiotics. This leaves only less effective and typically more toxic drugs as the only treatment options for XDR-TB is to use. A typical course of treatment last for 2 years and the disease usually causes severe lung damage. Often surgery is necessary to remove portions of the lung or a whole lung to curb the infection. Even with treatment, many people die. And when coupled with AIDS, XDR-TB is particularly lethal. Cases of XDR-TB have already been reported in 49 different countries and can be passed to uninfected people just like regular or drug-resistant TB. Dr. Sok Thim of the CHC/GHC reviews medication with a patient in her home in rural Svay Rieng. The woman is being treated at home for AIDS and drug-resistant TB. and is participating in the CHC's CAMELIA trial. Her TB is on its way to being cured, and her immune system is recovering with the AIDS drugs. The CHC has been working since 1994 to bring community-based tuberculosis care and treatment, education, research, and poverty reduction programs to Cambodians. In the last 14 years, CHC workers have cured 15,000 Cambodians of TB. At the end of 2007, the CHC was also caring for more than 2000 adults and children with HIV/AIDS, of whom 1250 were receiving life-saving antiretroviral drugs. To achieve these results, the CHC has partnered with other NGOs and the Cambodian government to build locally sustainable care, education, and research programs. Whether providing home TB or AIDS care, food or microloans, setting up rural clinics, renovating a major urban hospital, or launching a clinical research project, the CHC has done whatever it takes to help people get and stay well. The CHC has leveraged its expertise in community health to lead the fight against drug-resistant TB in Cambodia, using its community Community Treatment Model approach that uses community members, the family’s of patients and health workers in a partnership to deliver care. With the support of private donors and the WHO and UNITAID, and in collaboration with Medecins Sans Frontieres-France and MSF-Belgium, the CHC launched the Cambodian drug-resistant TB expansion project in collaboration with with the Cambodian National Tuberculosis Program in 2006. Second line antibiotics were obtained and desperately needed treatment was begun for 32 Cambodians confirmed drug-resistant TB. Most of these patients had already received repeated bouts of conventional TB treatment and had become sicker and sicker. The CHC, on behalf of the Cambodian National TB program, made the application to the the World Health Organization’s Green Light Committee to receive low-cost drug-resistant TB medicines for 130 patients. The CHC is one of just a few NGO’s that have successfully accessed the Green Light Program, which mainly serves governments. As of September, the CHC had 80 patients on drug-resistant TB therapy and had achieved four cures. The GHC has developed a comprehensive, countrywide treatment plan for patients with drug-resistant TB and for those who are co-infected with the AIDS virus. The plan includes drug-resistant TB infection control, training of physicians, nurses and community health workers in drug-resistant TB diagnosis, treatment and prevention. CHC/GHC, will continue to use its own funds to buy medicines, and continue to seek out additional support from other organizations. In short, we will do everything in our power to bring life-saving treatments to patients with drug-resistant TB. Working with our partners, MSF-Belgium and MSF-France, as well as UNITAID, the WHO and the StopTB Partnership, the CHC’s goal is to extend universal access to drug-resistant TB treatment to all who need it in Cambodia. 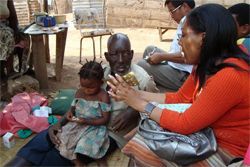 A Swazi TB field worker uses a home visit to explain medication side effects to a man with AIDS and severe TB. In the back, Dr. Sok Thim calculates the correct dose. The CHC’s grassroots solutions to the problems of TB, drug-resistant TB and HIV-AIDS in Cambodia are providing a powerful model for new programs in other countries. Under its new name, the Global Health Committee (GHC) will transfer the CHC’s approach to TB care to Ethiopia where it will work with the Federal Ministry of Health, the World Health Organization (WHO) and other partners to assist in the beginning of the first treatment program for drug-resistant tuberculosis in the country. Ethiopia has the seventh highest tuberculosis burden of all countries in the world, and the WHO estimates that there are approximately 6000 cases of drug-resistant TB in Ethiopia. Nonetheless, at this time, there is no access to the drugs needed to cure the disease. With support from the Jolie-Pitt Foundation, the GHC will work with the Ethiopian government to train health workers and provide a community-based structure to support desperately needed care. In addition, the Ethiopian Ministry of Health has been working with the WHO and other partners to obtain Green Light Committee approval to receive low-cost drug-resistant TB drugs for 45 patients, starting sometime this winter. The problem of finding and diagnosing new TB cases is of paramount importance in preventing the emergence of drug-resistant TB and creating a world free of TB. CHC’s Community Based Community Treatment Model approach, which is being scaled up in Cambodia by the Cambodian National TB Program, will serve as the model for a wider deployment of community Community Treatment Model in Ethiopia. The GHC is also working with Vietnamese colleagues in that country’s drug-resistant TB program. Vietnamese collaborators from the Pham Ngoc Thach Hospital in Ho Chi Minh City spent December 2007 training with CHC personnel in drug-resistant TB care. Together, the Southeast Asia neighbors are collaborating on drug-resistant TB/XDR-TB care while the Vietnamese await the arrival of medicines from the Green Light Committee. The plan for 2009 is to work together to develop a community-based drug-resistant TB program in rural areas of Vietnam bordering Cambodia. Recently CHC/GHC made a site visit to Swaziland, which has the highest HIV infection rate in the world (34 percent of Swazi citizens are HIV-positive), in 2009, the plan is for GHC to work with Swaziland’s National TB program to improve TB case detection and care for drug-resistant TB- and XDR-TB using the Community Treatment Model approach developed in Cambodia.